PRI Associate Frances Sheahan conducted research for PRI in women’s prisons in Kazakhstan and Kyrgyzstan in the second half of September. Here she writes about the impact of social isolation on women prisoners in Kazakhstan. The road from Karaganda city is full of potholes and bumps as it winds for an hour and a half through the steppe of central Kazakhstan towards Kukson Prison where nearly 1,000 women prisoners are serving their sentences. 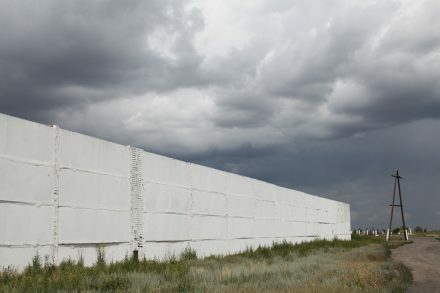 The prison was built in the 1930s and consists of a series of run-down low-rise buildings surrounded by the flat, empty landscape and huge skies typical of this region. Apparently there is a public bus which comes to the prison from Karaganda city but no-one is quite sure when it arrives nor how frequently it runs. There are only six women prisons, including Kukson, in the whole of Kazakhstan reflecting the fact that women represent just seven per cent of the overall prison population. Yet it is a vast country – the ninth largest in the world measured by area and it stretches more than 3,000 kilometres from east to west and 1,700 kilometres from north to south. The limited number of facilities, the enormous geographic area and the fact that different prisons have different levels of security all mean that women are often incarcerated far from home. In Kukson Prison, we were informed that only around 50 per cent of women were actually from the Karaganda region. The other half were from different regions of the country many well over 1,000 kilometers away. So family and friends of prisoners have to make long and expensive journeys to visit them. Families are not provided with any financial assistance for making visits and prison regulations allow for contact to be prohibited as a disciplinary sanction. Letters can be sent and phone calls made but at the prisoner’s own expense. It is hardly surprising that prisoners often lose the support of their family and friends – particularly over the course of long sentences – and become socially isolated as a result. The lack of visits also affects the physical health of women prisoners since many of them rely on visitors to bring medicine, food, warm clothes and toiletries. PRI surveyed 288 women in two women’s prisons in Kazakhstan as part of a research project on the background and characteristics of women prisoners and offenders (inspired by the UN Bangkok Rules). The detrimental impact of their social isolation is clear from the results of the survey. A quarter of these women said that their family had broken up as a result of their imprisonment and another quarter that they wanted to be placed in a prison nearer to their family. Over a third said that reunification with family and with children would help them build a new life on release; this is not surprising given that 76 per cent of these women are mothers. Half of women surveyed said that they experienced depression as a result of imprisonment and more than a third said they experienced fear, loneliness and anxiety. The UN Bangkok Rules are explicit that contact with families, including children, ‘shall be encouraged and facilitated by all reasonable means’ and ‘where possible, measures shall be taken to counterbalance disadvantages faced by women detained in institutions located far from their homes.’ This is for good reason – much research has demonstrated that regular contact with family, friends and the wider community is a prerequisite for successful rehabilitation and reintegration back into home communities upon release. This remains a long way from reality for the women prisoners we met in Kukson Prison. Frances Sheahan is a lawyer and consultant specialising in the rights of women and children in the criminal justice system. Frances’ research will be published in January 2014. It will be the second report in a series of three in our current research project inspired by Rule 67 of the UN Bangkok Rules. The first report was published last month and focused on women prisoners in Georgia and Armenia and the third report will look at Middle East and North Africa region. Thanks Frances for the work done. I had no clue on Kazakhstan prisons.